Julie - I can totally relate! And now, you've inspired me to work on my autism awareness! I feel like I never do enough - but I think that's because I'm not targeting and/or organizing properly! Kudos to you! Question, did you move to Washington because of the schools for C1? Thank you for your comment. I'm not all that organized, but I try to communicate about my son when it is necesarry or when the opportunity arises. We moved to Washington from Michigan for my husband's new job. The economy in Michigan is at the bottom of the list in terms of how well states are doing and his job there was in jeapordy. Relatively speaking, Washington is in decent shape. Julie, I have wanted to read this post for awhile but blogging kept getting pushed aside for other things. I love the term "Square One Awareness". It makes me think of something that has been a recurring thought recently. I'll try to explain it and this is my first attempt to put words to the thought. Sorry if this turns out lengthy. Because of our great experience with peer buddies during the school year for S we decided to do a birthday party as it was last week after school was out. It turned out 3 (2 girls 1 boy) peer buddies were able to come. We also had 2 boys he knew from church for a total of 6 kids. So glad it wasn't more, it was just right. I had a visual schedule set up for what we would do and even involved Sam in letting him decide what should come first, second etc. The party was so smooth, no transition issues from one to another activity. His peer buddies were right at home and knew exactly what to do or not to do. I met some wonderful parents in the process of this. At the end of the day I was thinking and evaluating how it went. The one thought I had was how nice it was to not have to explain to any parent about Sam because they already knew from the peer buddy process. Then I began to wonder what effective ways I can communicate to other adults about S as needed. It is basically the same idea as your square one awareness. I haven't come up with any great ideas for kids but don't have too many scenarios right now that force the need. I have been working with a piano teacher who wanted to take him on. I have realized how much information I want to share but don't want to overwhelm. 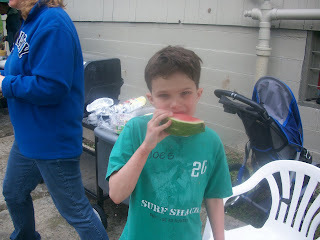 I have begun to make a list of things in general about autism that relate to S. as well as some of his quirks, preferred interests, how he identifies his escalating emotions, breaks, etc. I am going to turn it into a little info guide so to speak about him. It will change with time and need to be updated. But I figured I could provide this to a new Dr, teacher, parent of a new friend, swim instructor etc. and they would instantly have a mini picture into his world spreading a bit of autism awareness. Then if more information is desired it can be discussed and questions asked. I haven't finished it yet but I can't stop thinking about it. I realize its not everyone's style but it is my style and I am hoping it proves to be beneficial. I'll keep you posted on how it goes.